Halloween Altar | OFF KLTR! So…per usual I got some really awesome parenting materials from The Waldorf School. The quick little handout was about out Halloween – and how we need to shield young children from much of the scariness associated with the holiday these days. And the author had the greatest idea: make Halloween about more than dressing up in a costume and getting lots and lots of candy! It suggested making Halloween about remembering family members who have passed away. Sounds a lot like the Chinese Autumn Moon Festival and The Mexican Day of the Dead. So we did it!! 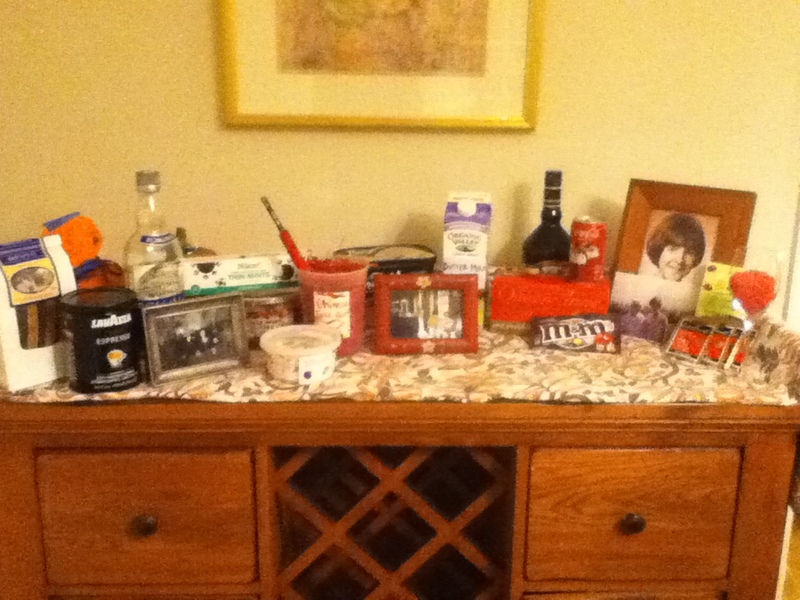 Keira and I made an altar for my mom, my mom’s mother, my dad’s parents, and Rob’s parents. Even Rob really got into it! It was so fun to remember all the people we love and to reminisce about their favorite foods and holidays and activities. And Keira and I had so much fun putting it together! We bought the non-perishable items and crafted the perishables (and things that I didn’t want to buy! ), like: White Zinfandel (my mom), ice cream (my grandma and Rob’s mom), butter milk and yogurt (for some unknown reason, my grandpa! ), and Chinese take-out (my grandma). The only hard part is enforcing the no-eating-the-altar rule!! ‘Til November 1st anyway!! I love it! My grandfather’s birthday was on Halloween (and it was Graham’s due date) so I always think of him around this time. We’ll have to be the coolest families on the block – with halloween altars!! This is fantastic. Love it. I don’t think I got that article, but now that I”m hardly doing drop-off anymore, it’s possible Karen did something similar that I just didn’t see. Would love to read it or get the name of it for myself and my Nest families too. Beautiful alter. So very sweet. Hi Heather! You know, I don’t remember where I got the article – and now I cannot find it! I used to be so organized! I don’t think that Wendy gave it to us. It must have been Marilyn. What is sooo weird about this handout is that I skimmed it and then recycled it. Keira actually took it out of the trash and asked me to read it to her! And we decided to make one together! I just checked the recycling and it’s not there again… If I find it, I’ll make sure you get a copy!! What a sweet idea- awesome that Keira got so into it! The food and beverage selections made me smile. Hope you guys are having fun on your hurricane day. We are!